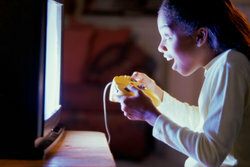 Playing video games for a short period each day could have a small but positive impact on child development, a study by Oxford University has suggested. Scientists found young people who spent less than an hour a day engaged in video games were better adjusted than those who did not play at all. However, children who used consoles for more than three hours reported lower satisfaction with their lives overall. Study lead and experimental psychologist Dr Andrew Przybylski said: "Being engaged in video games may give children a common language. For someone who is not part of this conversation, this might end up cutting the young person off." He has called for policies and guidelines that impose limits on the use of this technology need to take such evidence into account. Dr Przybylski points out that though the effect of video games on children is statistically significant in this study, factors such as the strength of family relationships play a larger role. The research analysed British surveys involving 5,000 young people aged 10-15 years-old and found out how much time they spent gaming on a typical school day - using consoles or computers. Some 75% of those questioned said they played video games daily. When compared with all other groups, including those who played no video games at all, young people reporting under an hour of play each day were most likely to say they were satisfied with their lives and showed the highest levels of positive social interactions. The group also had fewer problems with emotional issues and lower levels of hyperactivity. According to the results, people who spent more than three hours playing games were the least well adjusted.